Solar lighting is excellent choices for outdoor lighting because they’re effective, easy to install and environmentally friendly. Solar lighting is also safer than standard electric lighting because the solar lights use built-in solar panels and batteries to collect and store the sun’s energy to power the light that will eliminate the possibility of electrocution from accidentally cutting the cabling. Using solar lighting outdoors is a great idea, it is increasingly becoming more popular. But how to choose the best solar lights for your home? There are some primary rules that you should know before you go out and buy solar lights. What’s the best automatic gate opener for your driveway gate? A Solar light is also known as a solar lantern or solar lamp. Solar light is powered by the electricity generated from a very small solar panel that is put on top of it. It harnesses the sun’s energy to provide illumination for indoor and outdoor applications. This breakthrough technology delivers a very convenient way to light your home, your garden or might be for commercial projects such as street lighting system or entertainment events with minimal investment and maintenance. It makes a lot of sense to add them for exterior lighting around your home, your garden and particularly when you are camping without electricity, during the day it will be charged for use when it is dark. Some types of solar light have USB ports, so these do not only keep the LED lights working, but they can also be used to power other small devices like mobile phones. Before buying solar lights for home, you probably have a lot of questions in your mind relate to what actually the benefits of solar-powered lighting. To be honest, there are only 2 disadvantages with solar lighting are that they are more expensive than standard lamps and there are too many choices out there, finding the best solar light for outdoor and garden isn’t an easy task. However, today many manufacturers have been focusing on solar lighting. The technology has been improving quickly while the selling price also reduced. You can easily buy a home solar light from a Chinese brand at a very low price but only need replacing every 4-5 year. Say goodbye to darkness in the evening and costly electricity bills. The great thing about solar lights is the only money you spend on them is upfront. They don’t add anything to your electrical bill since they aren’t connected to the power grid. Solar lights can be used in areas where there is no electrical supply since they are perfect for outdoor activities, camping, hiking, decorating your home garden, walkway, patio, yard and they can be used indoor, too. Solar lights require a very little maintenance and easy to activate as they do not require wiring cables. Using solar lights plays a major role in reducing the carbon footprint that has been created by producing energy from non-renewable energy sources. Using solar lights is safer than standard electric light because they don’t need electrical cables. Particularly when you want to use them outdoor or you have children – they might trip over exposed cables from electrical lighting options. As I mention, choosing the best solar lights isn’t an easy task, it requires few more things than the best list that you have read from other review posts. Understanding how solar light works is the very important thing. Solar-powered lights use renewable energy, it is the lighting system composed of an LED lamp, Photovoltaic panels, built-in batteries, a charge controllers and a controller. A photovoltaic (PV) module collects energy from the sun and stores it in batteries to operate the required wattage of light at night when there is no sunlight to produce lighting. The light is being turned on by an intelligent controller which is switching on the LED light using the energy that has been stored. A solar cell consists of multiple layers of crystalline silicone and chemicals that create layers of negatively-charged electrons and positively-charged spaces. As sunlight passes through the solar cell, it excites the negatively-charged electrons and pushes them into the positively-charged spaces. The positively-charged spaces then transfer the electron stream as a direct current of electricity through wires embedded into the solar cell to a battery where the electricity is stored until it’s needed. The battery charges throughout the day as sunlight continues to be converted to electricity. The battery is a standard Nicad battery or Lithium-ion Battery, the lithium-ion battery solar lights are better than Nicad-battery solar lights but they are also more expensive. When a solar light’s battery dies, you can easily buy an another one to replace. The light will be shown through the LED light. LED lights are very high efficiency and long life, up to 50,000 hours. A cheap solar light uses only a single LED will not enough to provide illumination. More expensive lights may offer a dozen of LED or a combination of an LED and a small halogen flashlight bulb, provide good illumination. If you have to buy solar lights for making a trail or for emergencies, you need to make sure that they are bright enough to see. There are a bunch of different types of solar light on the market. What should you look for? What is going to be best suited to your needs? Finding high-quality solar-powered lights for outdoor applications such as your pathway, patio, yard or porch… can be a challenge. In the following guide, I want to talk about that. But as mentioned, there are many types of solar light – there’s no “One Size Fit All”. I recommend that you choose solar lights made with durable LEDs. They are much more dependable and last longer than other light sources. Solar-powered lights use LED bulbs that are measured by lumens, which measures the level of power that is produced by the light. More lumens means it is a brighter light, fewer lumens means it’s a dimmer light. When you are shopping for solar lights, compare lumens to be sure you are getting the amount of light or level of brightness as you want. BUY LUMENS, NOT WATTS, don’t look at the solar light’s wattage when you buy, it makes no sense, the thing you need is the number of lumens. The higher the number of lumens, the brighter the solar light. A typical single LED light will give off the equivalent of a 2-watt bulb. As a table above, an average 75W standard bulb produces about 12 lumens per watt, whereas LED lights produce 69 lumens per watt. This equates to LED lights being about 5.6 times more efficient in their energy usage. The brightness of the solar lights for you may vary widely. Some solar lights can produce about 15 to 20 lumens which generates a soft light that gives off a warm amber glow, while other solar lights can produce a much higher lumen rating up to 1400 lumens such as this DrawGreen solar sensor light, which creates a brighter light. Garden areas may require a low lumens light (1 to 20 lumens) to give off ambient light or for decorative purposes only. While yard, pathways, walkways and may require a higher lumens light. A strong light is especially important if you want to bring the light on travel or use it for security purposes. Best solar-powered security lights should offer more than 1000 lumens, like the Sunforce 82183 (180 LEDs and 1200 lumens). Another important feature you should look at is an adjustable brightness (dimming) switch that allows you to adjust the light from a bright and harsher light to a softer glow. Ultimately, the brightness of the solar light depends on the brightness of the sun and the amount of daylight it is exposed to, as well as the quality of the photovoltaic cells in the solar panel and the size of the LED bulb. We are talking about the solar-powered lights, meaning that they get energy from sunlight and store it in batteries to operate at night. The battery of a solar light is very important. You should be conscious of solar light’s battery before you go out and buy these lights. There are some types of solar light on the market with a brief description “NO-WIRE, NO BATTERIES REQUIRED”, like this solar LED path light from SolarGlow , it sells very well. In fact, that is just an intelligent marketing solution. Unlike others, this solar path light use built-in rechargeable lithium-ion batteries, they recharge themselves and you can’t replace these batteries. I think when anyone bought these solar lights, they would worry about the battery life. If you can’t change the batteries, later on down the road after the warranty is up, you would have to throw the light out, you can no longer use it. But don’t worry, these solar lights are extremely good with 100% lifetime replacement guarantee. They got many positive reviews on Amazon. If you don’t want to go with the solar lights above, ask the seller to make sure that the batteries can be changed in their solar lights they are selling. Some solar lights come with Ni-CD (Nickel Cadmium) batteries and some come with lithium-ion batteries, they give you the ability to recharge the batteries when needed and can generally last 1-2 year. It is important to ensure you charge your solar lights at least every three (3) months to ensure the battery stays in good shape. Solar lights with lithium-ion batteries are better than solar lights with Ni-CD batteries, but they are much more expensive. A lithium-ion solar light might cost about 40% more than a Ni-CD solar light. The biggest drawback of Ni-CD batteries is they suffer from a “memory effect” if they are discharged and recharged to the same state of charge several times. Another problem is reverse charging, which occurs due to an error by the user, or when a battery of several cells is fully discharged. Reverse charging can reduce battery life. Unlike Ni-CD batteries, lithium-ion batteries are smaller, lighter weight, they can be recharged before they are fully discharged without creating a “memory effect” and operate in a wider temperature range. When compared to Ni-Cd, the self-discharge in lithium-ion is less than half, making it well suited for modern fuel gauge applications. Lithium-ion batteries are also low maintenance. As you can see on Amazon, most popular solar lights come with lithium-ion batteries, like the InnoGear solar Spotlight. Rechargeable battery capacity of solar light shows the maximum amount of energy that can be stored in the battery and is measured in ampere-hour (Ah) or milliampere-hour (mAh). Generally, the more Ah a battery has, the longer it can run. If you buy a solar light with Ni-CD batteries, you will have the smallest capacities at average 600 mAh. Lithium-ion batteries come in wide range of capacities for solar lights, starting from 2000 mAh up to 6000 mAh. Lead acid batteries are only used for high power lighting usually come in capacities from 4000 mAh up to 7000 mAh. If you have searched for the solar lights on the internet, you probably heard about the 18650 lithium-ion rechargeable batteries. Most modern solar LED lights with a high number of lumens are designed to use this battery type. Manufacturers produce the lithium-ion 18650 at a size of 18mm by 65 mm, 2200 mAh and 3.7 volts. A 18650 lithium-ion battery can be fully recharged in 7-8 hours on a sunny day and then provides enough power to a 200 lumens solar light for 8-12 hours. Battery capacity alone won’t tell you how long the light can be powered using just the battery, but it can give you a more in-depth information about the overall quality of the lamp. If you are going to buy a low-voltage (low lumens) solar light to use in your garden, landscape lighting, lawn, patio… to generate a soft light that gives off a warm amber glow. You should choose a solar light that comes with a small battery capacity (less than 1000 mAh), like the Sogrand 12pcs-pack outdoor solar light (1.2V/300mAh). If you want a high power solar flood light, solar security light, solar spotlight, solar wall light, then better look at the models are equipped with a high capacity battery (more than 2000 mAh), like the VicTsing solar spotlight (200 lumens, 3.7V/2200mAh 18650 lithium-ion battery). To get the best battery life, recharge the batteries fully before you use them. If you are going to be using your solar light every day, remember to replace the battery regularly. Because we buy solar lights to use mostly for outdoor applications, the weather resistance feature is very important. A weather-resistant solar light can resist exposure to a range of weather conditions, from sunlight and heat to humidity. Outdoor solar lights must be properly weather-resistant to withstand any conditions all year round. Most outdoor solar lights you find on the market today come with an on/off switch that controlled by hand, meaning that when you want your solar light to turn on or turn off, you have to do it yourself. While more advanced solar lights have an automatic switch on/off, so it can switch itself on at dusk and off again at dawn. That sounds great, Right? However, it doesn’t mean that an auto on/off switch is better. Because to choose the right solar lights for home, you have to think about what will you use them for. If you want to place solar lights on any potentially treacherous walkways or patios on your premises. May be any dark wall around your home or the path slopes, then the solar lights with an automatic on/off switch are an efficient way of making everything works well in case you forget. On the other hand, if you are trying to get the garden fairy light to use for the special times such as a weekend Party, Christmas or birthday celebration, then you should buy the solar lights which you can turn the on/off switch to off until you are ready to use it. But if you are looking for a perfect solar light, I suggest that you buy the MiPow PlayBulb solar garden light. Whether you just want to light up the path to your door, or you want to add lighting accents to your garden, this thing will do it for you. MiPow PlayBulb is a smart Bluetooth wireless solar garden light. It enables you to control the light on-off, brightness, RGB colors and light effects (flashing, pulsing, rainbow, rainbow fading) and timer function etc. via APP on your mobile devices and bring you more fun. It also builds in light sensor to enable automatically turn off in the daytime and turn on in evening. With a centralized control system, the PLAYBULB X app auto connects PLAYBULB lighting using Bluetooth. Simply open the app for easily customized lighting. PLAYBULB X is supported by iPhone 4S or above, iPad 3 or above, iPod 5th generation or above (running iOS7) and Android 4.3 o above (with Bluetooth 4.0). When picking lights for the outside of a home, you should consider the home’s existing architecture. The goal of exterior lighting is to not only to brighten an area but also to harmonize with the design elements that are already in place. For example, a cottage style, a traditional home would look better with wrought iron or brass lighting fixtures, whereas stainless steel, aluminum, or brushed metal lighting structures would better be suited to very modern, contemporary homes. A rancher-style home that has a more country feel would benefit from fixtures that are matte-finished or rustic. Checking out home designer magazines or websites will provide shoppers with many ideas for how to choose lighting that meshes with the existing architecture. Spotlights can help provide accent or focused lighting to your home or garden. But to light up spaces or a specific location, spotlights need to produce quite a powerful light, it needs to be intense. A solar spotlight needs to have a good quality high watt solar panel, to get the maximum power from sunlight, and a decent battery capacity to allow the light to store a good amount of electricity for a long night. Spotlight brightness is measured in lumens, but some sellers don’t give the buyers clear information about the real number of lumens. Sometimes we have to look at the number and type of LEDs to determine the light output. I would recommend that the minimum lumen’s output for a solar spotlight should be 90. LED landscape spotlights which are generally accent lighting for shrubs, signs, and architecture should range from 100 to 300 lumens. Most popular solar spotlights come with 4 bright LED bulbs, 50 lumens in each LED and 200 lumens in total. Most solar spotlights are designed so they can be mounted in a number of ways and can be adjusted to shine in any direction. Often the solar panel can be mounted separately from the light, which allows you to put the panel in a place where it will get the sun and the light where it’s needed. Where should you install your LED spotlights? The location of your spotlights is extremely important. Naturally, you’ll want them to fully illuminate your targeted area without causing temporary blindness or waking up your neighbors. So you’ll want to mount them at least 9 feet from the ground and so that the light is pointed at a downward angle — around 22 degrees. Make sure it’s not pointed at your neighbors’ homes — or your windows or doors, for that matter. The URPOWER 2-in-1 solar spotlight is the perfect light for landscape uplighting, giving you lights along a pathway, driveway, deck or dock, etc. For a strong source of light with 200 Lumens of power output in total 4 LED bulbs, built-in 18650 lithium rechargeable battery (2200mAh), the URPOWER solar spotlights will give you with a bright warm light for 6-9 hours after fully charged depending on exposure to direct sunlight. One of the best features of this spotlight is it can be adjusted the light head angle 90-degree to illuminate the perfect spot and adjusted the solar panel angle 180-degree for optimum sun exposure. This solar light is also designed to be stuck into the ground or screwed to mount on the wall. There are 2 settings for medium and high brightness: bright light mode or dim light mode. And you won’t need to turn lights on/off as they are automatic once the sun sets. The DrawGreen Bright LED Solar Motion Sensor Spotlights are the multifunction solar light. These spotlights use a motion sensor and a timer so the light will be automatically turned on when movement is detected within the range of the sensor. Thus, these solar lights also can be used as the security light. The DrawGreen solar spotlights will provide you an extra lighting power with 1400 lumens which is equivalent to 110W incandescent bulbs, bright LED with optics-grade PMMA lens makes it much brighter so they are ideal for lighting up your pool, deck, entranceway or driveway. With a super strong lithium-ion battery capacity, up to 2600 mAh, these spotlights can last over 30 hours lighting, which is much longer than other similar products in the market. But the DrawGreen spotlights will take longer to fully charge, about 6-8 hours on sunny days while the other spotlights only take about 4-5 hours. One of the highlights of these spotlights is that they can be adjusted to 360-degree, and the solar panel is also with adjusted angles, so you can get the full range of lighting and sensing angle. The lights are made from durable aluminum-alloy case and weather-resistant reflective plastic housing and the solar panels are extra large to absorb more light, which means they can stay brighter for longer. There are a lot of reasons why we should add security lighting to our home. Security lighting in the garden deters thrives, protect your family and it makes you feel safer. 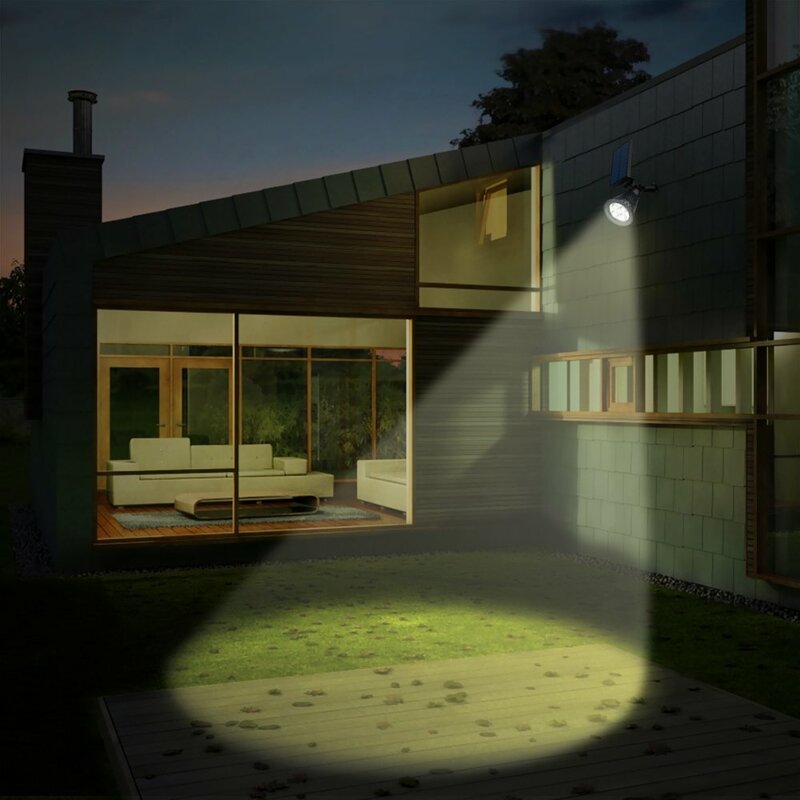 Any light is better than no light at all, but there are a few important factors to consider when you’re shopping around for security lighting. The best security light should include a motion sensor and LED lights. Homeowners can put a camera alongside a light to record any intruder. The primary characteristics of a security light are: it’s bright, it will automatically turn the light on when it detected the radiate from moving objects such as people, animals or car, etc, it’s often mounted higher than other lights to covers a large area. If you have a fairly busy area such as a driveway that has multiple activations per night, you should choose a solar light with a high watt panel and a large battery capacity, additionally, a south-facing aspect without shade would be ideal for consistent all year round use. But don’t buy the solar lights with too high lumens, because it doesn’t necessary. I recommend you buy the MAXSA Innovations 44218 Motion Dual Head LED Security Spotlight (160 lumens). If you want a solar security light to light up a dark area few times per night, coming back from and going to work, letting the dogs out, and having the odd friend visitor round for drinks, then you should buy a solar motion sensor light can generate 400-600 lumens. InnoGear Solar Lights 30 LED Wall Light (450 lumens and 18650 lithium-ion battery) is the best choice for you. There are some dangerous dark areas around your home where you always feel a certain vulnerability however is not often used. For example, a garden shed or gate leading to a public alleyway which is seldom used after dark. In this case, you don’t need a solar light with a really high battery capacity, and a Ni-CD battery solar light may save you a few bucks. But when it is activated, it has to provide a pretty strong bright light to highlight this area. Then the Sunforce 82080 80-LED Solar Motion Flood Light, 900 Lumens is a good way to go. We use solar flood lights to add lighting to outdoor property at night. In recent year the use of solar flood lights has become popular as homeowners use them for security purpose. Solar flood lights provide clearer and brighter light than other types of solar outdoor light. Before buying the best solar flood light, you should consider some important factors, and the flood lights you buy should meet your lighting requirements and offer durability coupled with versatility at the same time. As I mentioned above, best solar flood lights should come with LED bulbs. LED bulbs consume less energy than any other types of bulb such as Fluorescent bulbs, Halogen bulbs, Incandescent bulb, and last an extremely long time if kept in good condition. In fact, manufacturers claim that LED bulbs can last up to 50,000 hours, which is about 46 years if used three hours per day. Brightness or number of lumen that floodlight produces is a crucial factor. You need to know how much lumens your solar flood light gives off. Because flood lights are broad-beamed, high-intensity artificial lights, they usually come with a high amount of lumen. The average lumens needed should be from 300 to 1000 lumens. You also should consider whether or not motion sensor technology is something that is needed or desired. If the intent is to keep the yard safe by discouraging trespassers, a solar flood light with motion sensor on the lawn could be useful. This provides a great safety feature, and the automatic shut-off also prevents any wasted energy if the owner forgets to turn the light off. Motion sensor flood lights are both practical and affordable, but before you install your solar flood light, you still need to consider your neighbor’s privacy when using the sensor. The Robust Solar Motion Flood Light will bring you a super bright white light combined with a motion sensor that is ideal for all your lighting and security needs. With 80 super bright LED bulbs and a super high-efficiency solar panel, this solar flood light can provide 700 lumens and last over night. With the motion sensor detecting range is about 16-32 feet, this solar flood light is perfect to light up the pitch black areas in the yard. It gives enough light that you can walk away and see at least 45 feet. The length of the wire about 16.4 ft from the solar panel to the unit appears quite adequate for those who need to mount the solar panel farther away from the LED. The lamp can be mounted in a dark place and the solar panel can be mounted another place to get maximum sun power. You can have the light stay on anywhere from 3 seconds to a full 10 minutes with 8 times intervals in between. So far, this light has exceeded our expectations! The RuggedGrade High Power Solar Motion Flood Light is a heavy duty flood light. It can provide super high brightness with 1000 lumens, 10 Watts of LED flood light power. With a motion sensor combined that is ideal for lighting up your yard, garden and particularly perfect for security purpose whether home or business office. The RuggedGrade flood light uses a high efficiency big solar panel. You can mount this panel separate to get the best power from sunlight and then connect to the LED light through 3.5 meter cable. You can easily install the flood light and solar panel anywhere in minutes, no need to hire an electrician. This flood light comes with 8000 mAh lithium-ion batteries – the highest number of battery capacity for a solar light I have ever seen. Battery can be changed without replacing unit. Dim mode is at 10% lighting for saving power when no motion. But when motion is detected, light can go from 10% power to full brightness. If you want to go with the high lumen output solar flood light, the MicroSolar heavy duty solar flood light is a great idea. The light is very bright, give you 500 lumens of power output in total 120 pcs natural white (not bluish) super high brightness LED. This comes with a 10W solar panel and 4000 mAh lithium-ion battery that can give lighting 8-12 hours at night continuously. This solar flood light doesn’t offer a built-in battery so you can purchase the replacement from company. Remember that eventually the batteries will die and you will have to replace it, but it is a story of 2 years later. The light is already included one 16.4 feet wire to attach the solar panel to the light which allows for placing the panel anywhere to get the best result. As the name implies, path lights are meant to light paths, walkways, driveway perimeters or other small areas around your home and in your landscape. Solar Path lights serve both a useful and decorative purpose, lighting up any pathways in a garden at night so that it is easy for people to find their way. Solar path lights come in an array of designs. Some are more efficient while others are mainly cosmetically enhancing. It’s important to know which is appropriate for each individual when decorating the garden or backyard. Not only do solar path lights brighten the pathway during the evenings, they can also add value to the home as the extra illumination will add curb appeal to the neighborhood. This depends on current landscaping and other factors, but you will need to decide if they are trying to be subtle and promote safety or showcase their home for decorative purposes. When choosing a solar path light for your landscape, you first need to take into consideration the style of your outdoor space. Try to combine path lighting with existing features found in outdoor sconces, front porch flush mounts, and any in-ground lights. Creating a congruent space will benefit your design scheme. You’ll also want to consider important sizing dimensions like height, width, and weight of the path light to ensure you are choosing the right fixture for your application. Solar path lights can provide between 1-100 lumens of light. If your solar path lights are considered decorative accent lighting, 1-10 lumens is generally sufficient to add dimension, color, and interest. If you want to use them to give your visitors a clear lighting to see the walkway, 50-100 lumens is considered bright enough. Best Solar path lights should be designed to be outside through the rain, sunlight, and snow. The better the quality the longer the pathway lights will be able to withstand the elements, so if you live in a harsh climate it might be a good idea to buy top quality solar path light. Another point to consider when it comes to weather is that LEDs do not release much heat and therefore will not be able to melt away snow and ice. Be sure to choose a solar path light that is designed to shed snow. This pack of solar path light from SolarGlow LED Garden light contains 6 solar lights that cover your pathway. With 10 lumens of lighting power from each LED light, they will bring a subtle glow to your garden or pathway. The stake has a sharp point and won’t require much pushing to get it on the ground, they will take you less than 10 minutes to install and then they will work immediately right out of the box. Just plant them into the ground, right where you want them. But to get the best lighting quality at night, place the lights in direct sunlight. The SolarGlow path lights use built-in lithium-ion batteries, meaning that you can’t replace the batteries when something down the road. But the seller provides you an offer which couldn’t be better: 100% LIFETIME REPLACEMENT GUARANTEE! That means you don’t have to worry about the batteries. With a bright sun on a clear day, the LED charge can last for 8 hours or more during the night! I would recommend buying things from this company and these are also the most fairly-priced high-quality LED lights you’ll find anywhere! This pack of solar path light from Moonrays 91381 Payton Solar Plastic Path Light includes 8 solar lights that can provide 2.4 lumens of light in a 360-degree display of patterned light covering a 12-inch area. These lights are perfect for providing a beautiful soft light for illumination of pathways or among the foliage in your garden. Let Moonrays help make your outdoor settings as livable, enjoyable, and charming as any room in your home. The lights are made from durable black plastic construction. The 8 path lights work right out of the box. No wiring involved! Simply push the stake into the ground and slide on the assembled lamp! The HGTV solar pathway lights are perfect for the front yard or backyard pathways. They are suitable for any home and are crafted in a beautiful powder-coated oil rubbed bronze and stainless steel. Each light measures 5.9in (L) & 18.4in (H) and includes 1 LED light, crystalline solar panel, 1 rechargeable 1.2V 400 mAh Ni-MH battery, and an elegant glass lens. They can run up to 8 hours on a full charge and with 3 lumens per light provides maximum energy to project a beautiful pattern of warm, natural white LED light. There are many reasons why you should buy a solar motion sensor light for your home, particularly for security purpose. Solar motion sensor lights use a clever motion sensor and a timer so that area of darkness can be illuminated when movement is detected within the range of the sensor. The sensitivity of the motion sensor can be adjusted to trigger at the smallest of movements such as small animals or wind blowing objects around. A bright light will automatically turn the light on when your visitors come to your home or when it deters thieves and burglars that attempt to steal. It also will automatically turn off in daytime or bright area. At night, motion sensor will turn on DIM light when no motion over there. Picking the best outdoor solar motion sensor lights requires some key factors. The Sensing Zone is the first thing you should look at when searching for solar motion sensor lights. The Sensing Zone includes the degree of coverage that the sensor can provide and the distance that the sensor can detect movement. Some solar motion sensor lights can detect movement in a 90-degree angle, like the Best100Stuff Solar Motion Sensor Light. But you should only buy the sensor lights that provide coverage for 90-degree angles for a small area. Most popular solar motion sensor lights on the market right now provide coverage for 120-degree and 180-degree angles that are ideal for wall-mounting. These types are the best choice if you want to add solar lighting around your home, at every dark wall side where you never feel safe or for pathways. Some solar motion sensor lights provide an extra wide sensing zone the degree of coverage is up to 360-degree. But I think this isn’t necessary unless you want to add sensor lighting in the garden for security purpose. If the purpose for the motion light is for security, you definitely want the maximum distance and possible. Some sensor lights have a distance range of 60 feet, like the Designers Edge L950 9 LED Motion Activated Solar Light. But this kind of range isn’t suitable for your home because it can trigger a false alarm as it can switch the light on when someone is just walking by. We should only buy it for commercial use. For home security, I would recommend that you buy a solar motion sensor light has a distance range of 10-26 feet. Most solar motion sensor lights these days are powered by LED bulbs. LED solar motion sensor lights can be designed with a low level of brightness (20-100 lumens) which only can produce a soft glow for less than 15 feet of distance, like the LAMPAT Waterproof Wireless Security Bright Motion Sensor Solar Light (80 lumens). Some can produce a super high level of brightness and can illuminate an entire yard, like the OuTera 3200mA 44 LED Solar Wall Light with Motion Sensor (1600 lumens). Best solar motion sensor lights to use as outdoor security lighting system should produce the output from 300 to 800 lumens. These will give you a substantial amount of light up to 30 feet. These are also suitable for high traffic areas like walkways around your home, your back yard, and driveways. 1. Full-on mode. From sunset to sunrise, the solar light will remain on. Then the solar light will automatically turn itself off at daybreak. The Litom motion sensor solar lights provide you 440 lumens of light that can give off enough light to illuminate your backyard. These motion sensor lights are IP65 waterproof so it can withstand rain and other extreme weather conditions. To get the best results from the solar light and motion sensor, install the lights so that they face south and make sure they absorb the sunlight directly, and charge the batteries before turning the lights on for the first time. The Magictec Wireless Solar Motion Security Lights come with 45 LED bulbs that offer super bright lighting for a wide area and strong illumination. With 450 lumens of light, these solar light is perfect for garage, driveway, pathway, yard, fence etc. With a new upgraded design, an extra large solar panel and strong LED lights that have a lifespan of 5 years, these solar lights can provide you with light for up to 12 hours, and a maximum of 50,000 hours. Magictec solar lights comes with high efficient solar panel compared with other solar lights, this means getting faster battery charging in less sunshine environment. To get the best performance out of the light and motion sensor, the solar panel needs to be placed where it can capture the most sunlight. This another version of solar light from Litom motion sensor solar light includes 24 LED bulbs that provide a super bright level of illumination for a wide area, which is far more brighter to provide security light for your home or business accommodation. With 3LEDs setup on both sides of the solar lights which create a wider range of luminosity and increase the maximum lighting angle up to 270 degrees. Litom Solar motion light installed with sensitive sensor ball head, the recommended install height is 5.6-6.6 FT, it can detect motion up to 10-26 feet away at a 120-degree angle. This solar power motion light automatically turns on when it senses the motion of someone driving to your house or walking to your door. This solar motion sensor light comes with 3 different lighting Sensing modes: medium light mode, dim light sensor light mode and sensor mode. So you can choose the most appropriate mode for your needs and desires. The lights are very easy to install, it can be mounted on the wall with provided wall plug and screws in seconds, no cable or wire necessary. In winter, the solar light is not able to be fully charged for the lack of light. So it’s normal if the solar light is not bright enough and illumination time is short. Please make sure the item is put in direct sunlight all day so that it can absorb more sunlight for charging.